Kovalam beach is Kerala's most famous beach town. Unlike quieter Varkala, it's well and truly been discovered and developed. It's brash and at odds with the rest of Kerala. The action congregates around two main beaches -- Hawa (also called Eve's beach) and Lighthouse (the biggest and busiest of the two) -- with a walkway along the seafront. Samudra beach, to the north, is separated from the other beaches by a large promontory. This makes it relatively free of tourists. 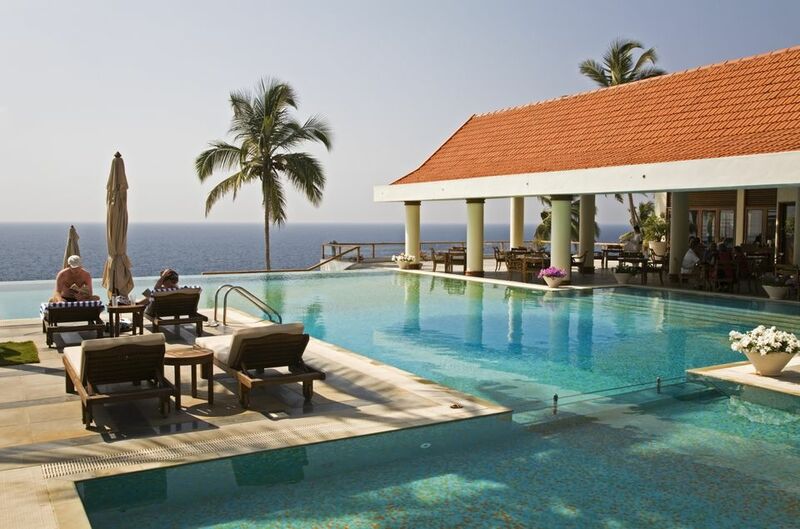 There's no shortage of hotels in Kovalam beach, but these are among the best ones to suit all budgets. If you're looking to save money, travel to Kovalam during the May to September monsoon season, and you'll be able to enjoy discounts of 50% or more on room rates. This makes luxury hotels much more affordable. Want to stay in secluded luxury? The boutique Surya Samudra is the most indulgent property you'll find. It's set on 20 acres of landscaped grounds atop a cliff in a secluded spot south of the main beaches, and has 33 heritage cottages and rooms (think terracotta roofs, wooden pillars, and tiled floors). The airy cottages, which feature open-air bathrooms, are very private and there's plenty of space to spread out. The sea-facing ones are particularly captivating. Other facilities include a reputable Ayurvedic spa, two restaurants, and infinity pool. Rates: From about 10,000 rupees per night, plus tax, for a garden view cottage during the monsoon season. This increases to around 25,000 rupees, plus tax, during peak season. Breakfast is included. The very popular Leela is looking a bit tired these days but the atmosphere and views are magical, making this hotel very high on romance. The hotel is situated on the side of a cliff overlooking Samudra beach. It's a substantial property with 183 rooms a private beach. The beach view rooms have their own sun deck, while the peaceful garden view rooms are located in a coconut grove right near the ocean. There's a stunning infinity swimming pool as well. Rates: It's possible to pick up a double room for around 8,000 rupees per night, plus tax, during the monsoon. Otherwise, rates go up to 20,000 rupees or more plus tax, depending on the time of year. The popular Taj Green Cove Resort & Spa, on a lush hillside near Samudra beach, wears a revitalized new look with tropical Indo-Balinese decor. The hotel has 59 cottages spread over 16 acres. It's peaceful and relaxing, with outstanding service. A highlight is the hotel's beach-side restaurant called Bait, which serves up fresh seafood under the moonlight. However, the hotel isn't a beach resort. The ocean is around 10 minutes walk away, and the beach is submerged from March to November. So, most guests prefer to relax by the infinity pool amid nature. Rates: Expect to pay 8,000 rupees plus tax for a double room during the monsoon season. Otherwise, rates go up to about 18,500 rupees a night, plus tax. Turtle on the Beach faces Hawa beach (Eve's beach). It has a Zen feel, with large Buddha statue and elevated lounge with sea views. The property is spread over two wings -- the main building and an adjacent annex known as Turtle Annexe. There are seven categories of rooms, including spacious duplex rooms for families. Most front the ocean. There's also an Ayurvedic spa on the premises, along with swimming pool and health club, yoga zone, activity area, and three restaurants. Do note that unlike its name may imply, the hotel doesn't have beach access. However, it does provide a free shuttle bus to the beach. Rates: From around 5,000 rupees plus tax during the monsoon season, increasing to 7,500 rupees plus tax upwards in peak season. Breakfast is included. This value-for-money resort is owned by Kerala Tourism Development Corporation. It's situated next to the Taj Green Cove Resort & Spa at quieter Samudra beach. What the hotel really has going for it is its picturesque location and the fact that it has direct beach access. Although the hotel is old, it's cleaner and better maintained than many state government hotels in India. Yet, it could be greatly improved with a few renovations. The hotel caters primarily to Indian families, and foreign guests may find the service and facilities to be lacking. Alcohol must be consumed away from the restaurant. (There is a beer parlor.) Rooms are basic but functional. The big plus point is that they face the ocean. There's a swimming pool too. What makes Sea Rock Beach Resort stand out is that it's the only hotel bang on Hawa beach with rooms that have balconies overlooking the ocean. You'll be serenaded by the sound of waves crashing. However, the hotel is let down by complaints of poor service, cleanliness and maintenance. The food served in the terrace restaurant is also quite expensive. There are plenty of other decent restaurants in the vicinity though. Rates: 1,800- 5,500 rupees per night, plus tax. Breakfast is included. Tucked away in a quiet lane just behind Lighthouse beach, Johny's Beach House is an oasis of a guesthouse with flourishing tropical garden. The owner, Johny, is the perfect host and can't do enough for guests. Each room has its own balcony, and the top floor ones have a sea view. The beds have soft mattresses and the bathrooms are new. There's even a shared kitchen, lounge, and games room for guests to use. You'll feel right at home! Rates: 2,000-3,250 rupees per night, including breakfast. Beach Florra Inn is the pick of budget options on Lighthouse beach. It's located at the far end of the beach, right near the lighthouse. The hotel has 16 large comfortable rooms, some with ocean views, and excellent hospitality. There's also a common balcony facing the ocean and a seafront restaurant as well. The only drawback is that the road doesn't reach the property, but porter assistance is provided to carry luggage. Rates: 700-3,500 rupees per night, plus tax. Little Elephant Beach Resort is in the same area as Beach Florra Inn but is set just back from the beach. The accommodations consist of five double rooms and two apartments with sea views, plus an additional six garden rooms. All were built or renovated in 2013, so they're modern and attractive, and spotlessly clean. The huge rooms on the upper floors open out on to equally huge balconies. The hotel has its own Ayurvedic center, and holds morning and afternoon yoga classes. Dental treatment can be arranged as well. Rates: 1,200-5,500 rupees per night, plus tax. Also in the same area, Stay Well Ayurvedic Beach Resort is ideal for a wellness-focused vacation. This small and inviting blue family-run guesthouse is arguably the best inexpensive place to stay in the area. There are six rooms, most with private balconies, and one with private kitchen. Ayurvedic treatments are provided on the premises by a qualified Ayurvedic doctor, and yoga sessions are held on the rooftop. Rooms are neat and tidy. It's a real gem with caring staff! Rates: From 500 rupees per night, plus tax.